She sits on a backless stool, her back straight, narrating the events of last night — she was at a shoot for The 5 Show dressed as a villain from Power Rangers. Behind her, a golden Buddha and porcelain deities look on, picture frames of family events and an assortment of certificates line the adjacent wall, and her Siamese cat Ashley sleeps soundly on the couch. 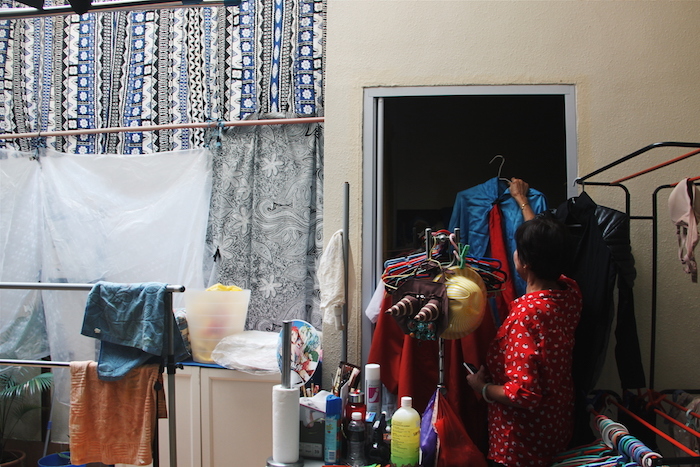 Shirley Chua is at home dabbling in some light housework like most housewives on a late balmy afternoon. 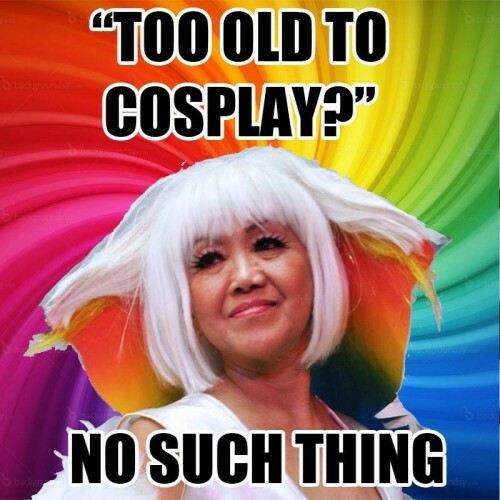 But unlike most housewives, Shirley Chua has a not-so-secret life as a 68-year-old cosplayer. At 3 in the afternoon, a sweet and bubbly lady greets me at the door. 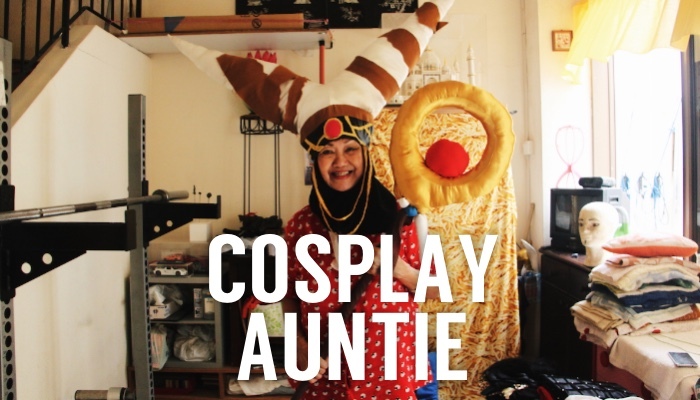 Aunty Shirley — as she is known in the cosplay community — is pint-sized and looks youthful for her age. She proves this further by showing me some family pictures. “This is my younger brother!” she exclaims. He does not look younger than her. Her smiley demeanour and bright eyes give her a youthfulness that is unlike other people her age. 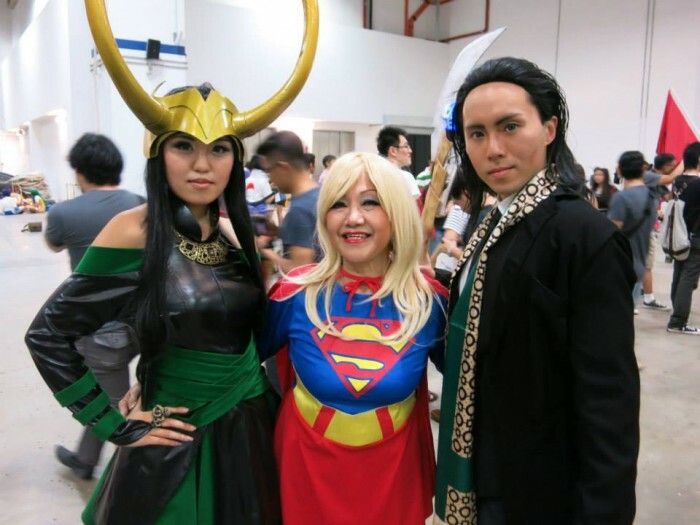 When Shirley’s son was in secondary school, he immersed himself in the world of cosplay. As a young teenager, he was going to need all the chaperoning he could get to attend conventions and events — and Shirley was happy to volunteer. “For me I’m very sociable, it’s only my husband who wasn’t happy at first. He’s very, very shy,” she says, laughing. “But I couldn’t go near him! Young teenagers ah, don’t want their mothers to be too close, so I just lingered around.” Besides following her son Skyy to events, she was also responsible for sewing his costumes, which she enjoyed. It was during her time lurking around at conventions when Shirley found that most parents thought of cosplaying as a negative thing. “I kept hearing other parents saying it’s a waste of time and money, and also a bad influence on their kids — I really think it is not true. It’s really just a hobby for them, and it’s good to see young children passionate about something,” she says. After years of getting involved with her son’s cosplaying, she decided to drop the bomb in 2011 and said to her son: “Mama also want to join.” The first thing he told her, Shirley relates, was that it was a “young people activity”, but he obliged and found her some age-appropriate roles to start with. Her first role: Erina Joestar, grandmother to Joseph Joestar, a character from Japanese manga JoJo’s Bizarre Adventure. “I loved doing the catwalk at the event! When I came out, everyone clapped and cheered,” Shirley recalls of her very first cosplay outing at Downtown East. She adds, “I think people did not expect to see an actual auntie.” Since then, her repertoire of costumes has grown, according to her son’s advice to stick to more mainstream characters: a Disney fairy godmother, Rita Repulsa from Power Rangers, the Red Queen from Alice In Wonderland. Soon, she started to experiment more and requested to try “younger outfits”. Case in point: Supergirl. Despite her son’s disapproval of the idea, she secretly bought a Supergirl costume online, choosing to let her son know about it only on a convention day itself. Thankfully, the big reveal was a success and she was even complimented by him saying that she really looked young. Nice move. Besides the Supergirl outfit, all of her clothes are homemade. Shirley showed me her secret weapon — a classic Singer sewing machine she set up in her basement — which was also her workshop of sorts. “Some outfits I can take a few days to complete but my Red Queen one took three months because of all the details in it,” she explains. One by one, the outfits came out: Rita Repulsa’s headgear, her son’s Loki get-up, Chun Li, Storm (“I look really young when I wear this!”). All this, while I stood there thinking that you couldn’t have a groovier mother than Shirley. Shirley’s hip auntie street cred soon began to pick up, and she became a fixture at most cosplay conventions. Like always, popularity and fans comes with a Facebook page. Her son set one up for her, taught her the ropes of Facebook updating, and left it at that. Within a day, her Aunty Shirley page — get this — amassed over 1000 likes organically, sans a blog, sponsorship deal, advertorials and all the frills. This year, her page is a flurry of activities. Besides making appearances at events, she can also add another achievement to her plate: Shirley’s face is on a plane. 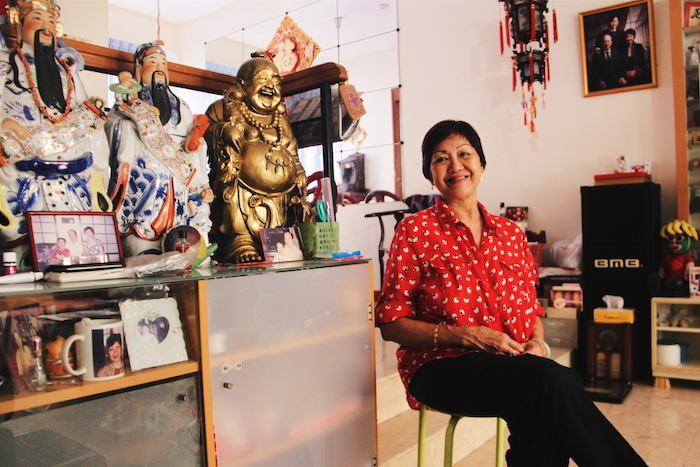 Nominated by her family members, Shirley was part of a contingent of 50 to be honoured in Jetstar’s SG50 community campaign. Plus, she’s enjoyed a lot of TV screen time these days too on local talkshows and the news. Not bad for an ‘aunty’, eh? I asked Shirley what it is about cosplaying that she finds special. The first thing she said was family. 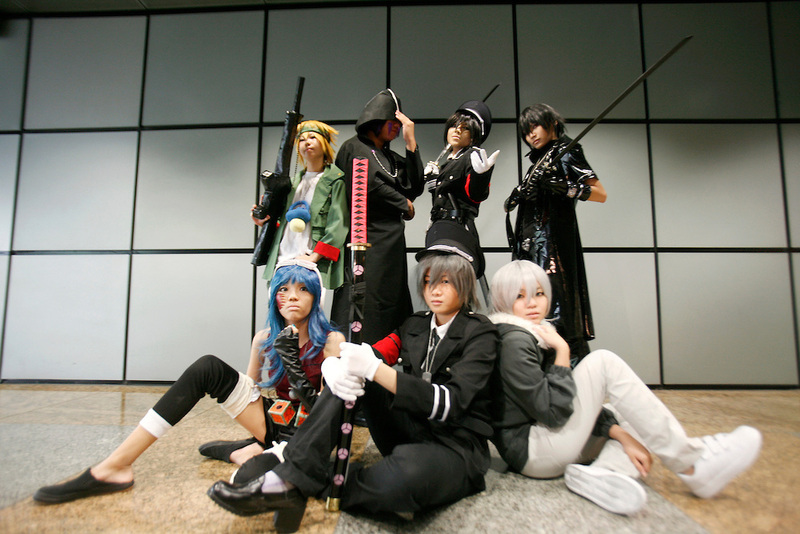 Today, she cosplays with her son and his girlfriend at events, and she sees it as a family bonding activity. Her husband still shies away from all the attention, but happily drives them to events and accepts that it’s something that is important to his wife and son. There are so many ways to be brave in this world, and for Shirley and her friends, it is through cosplay. Shirley goes on to talk about parents who don’t see cosplay as an opportunity to bond with their children, why young people need to be confident and be passionate in everything they do, that she would encourage people her age to also cosplay, and most importantly, how much her life has changed for the better since she took the leap into the intriguing world of cosplay. “It’s a very colourful world, and it’s fun. I have something to look forward to. I may be be 68 but I also want to have fun, right?” she laughs. I was sitting there being schooled about life basically, by someone who is really living. I guess you really find courage in the most unlikely places. It is evening outside and Ashley the cat lazily stirs awake. I take it as my cue to wrap up the interview. While I put on my shoes, I ask her what she does daily on off-peak days. “Everyday I’ll do some housework, then I’ll go online to check on my page and chat with some friends, and then play some games,” she enthuses. She plays FarmVille — that’s right, she’s a cosplayer and a casual gamer — she is officially the coolest 68-year-old I have ever met.